In the Santa Clara Valley there are many signs that our ecosystems are in danger. One major indicator is a species of bird that is vanishing from our basin at an alarming rate. In the orchard days of San Jose these birds could be found by the hundreds but now just 40 pairs remain. Loss of habitat do to human development of the land is the primary source of the Western Burrowing Owl’s decline. They inhabit ground squirrel burrows in open meadows along the bay and empty land beside the valley’s rivers. Their diet consists of small reptiles, insects like grasshoppers, and small rodents like mice and voles. They nest in pairs and rear young in the spring and summer. During the fall migration the population of owls slightly increases. The Western Burrowing Owl is diurnal, they are most active in the early morning and at dusk but can be found sitting sentry outside their burrows for most of the day. 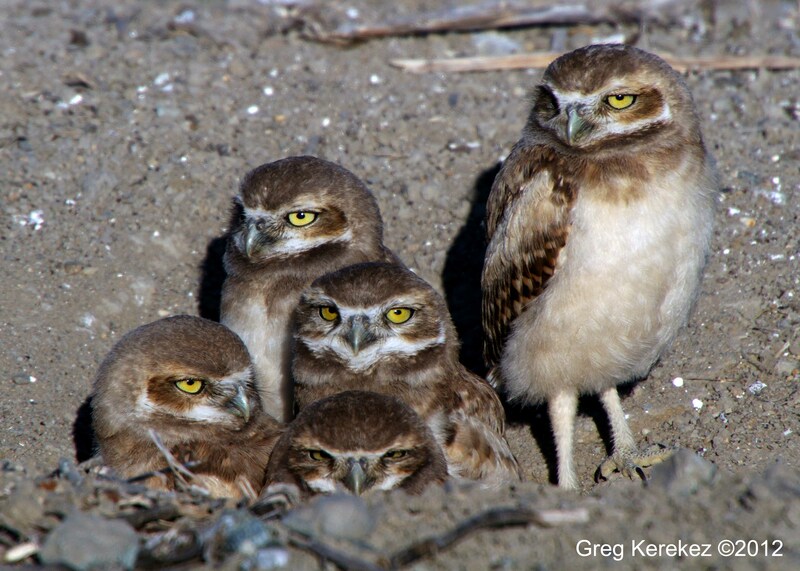 I am currently a member of Santa Clara Valley Audubon’s Burrowing Owl Preservation Committee. We monitor the Owl population of Santa Clara Valley, reporting owl locations to Department of Fish and Game. We also advocate for the preservation of their habitat. Our most recent success is preventing Housing on North Bay Shore a crucial piece of Burrowing Owl habitat in Mountain View, CA. and expanding potential habitat by installing artificial burrows at San Jose’s Water Pollution Control Plant. We are currently working with the city of San Jose to protect their owl population. We have communicated key areas for the owl to San Jose City Council and are working with them and City Planning to secure and restore habitat for the owls future. Because of their scarcity they have become a highly sought after photographic subject to some photographers. Photog’s beware: getting too close can permanently scare away an owl from its burrow or alert a predator to the owls location. While monitoring a pair along orchard parkway I use a few techniques to get close with out disturbing them. I always use a tripod so I can have sharp photographs to crop into later. I also use a 2x converter on my 500mm lens so I can get a close up shot with out being close to the owls.Also shooting from ground level and covering myself with dead grass allows me to blend in with the horizon and the owls can proceed with life unfettered. When observing these creatures be aware of your surroundings for predatory mammals and never approach a burrow when there is a hawk on the horizon. I’m a Santa Cruz photographer very interested in learning more of the Santa Clara (and Santa Cruz) burrowing owl population and help education from a photographic perspective. I’m unsure who to reach out to learn more. FYI – I take all caution and care when approaching subjects.